Mirabai Starr -- "Saint Francis of Assisi", "Saint Teresa of Avila", and "The Showings of Julian of Norwich"
Mirabai Starr will speak about and sign her new books, Saint Francis of Assisi, Saint Teresa of Avila, and The Showings of Julian of Norwich on Wednesday, December 11th at 7:30pm. About the books: A fresh and contemporary translation of one of the best loved and influential mystical texts of all time, The Showings of Julian of Norwich brings the message and spirituality of this 14th century mystic to 21st century readers. With Saint Teresa of Avila: Passionate Mystic, Mirabai Starr presents a beautiful devotional reader that gives you a direct link to the living presence of this gentle saint. Filled with the prayers Teresa used, translations of her writing, and stories from her life, this book is a treasury of contemplations and wisdom perfect for any home shrine or spiritual library. Saint Francis of Assisi: Brother of Creation is an essential devotional reader for forming a personal connection to the spirit of this modest Italian sage. Mirabai Starr compiles stories, prayers, and translations of Francis writings to help readers discover a nourishing devotion to God and a profound compassion toward all living things. 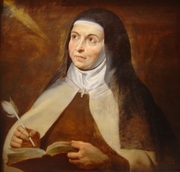 St. Teresa of Ávila is currently considered a "single author." If one or more works are by a distinct, homonymous authors, go ahead and split the author. St. Teresa of Ávila is composed of 128 names. You can examine and separate out names.